Over the past few years, we've frequently given Trevor's godmother (Jonna) tickets to join us for dinner and a show. Usually I check in with her ahead of time and tell her to save a certain date and keep the actual outing a surprise until she opens up her clue to our destination. (You may recall the 'coat of many colors' card that Trevor and I made for Jonna last year.) This is what she opened this year. Jonna immediately guessed 'The Sound of Music.' Nope! It's the OTHER nun-related musical.... Nunsense! Our local theater group is performing it in the spring. I'm counting on the fact that their production will be appropriate for an almost-9-year old. I haven't seen it since college. Neither Steve nor Jonna has ever seen it. I'm looking forward to it. Cut a large, narrow oval from black cardstock and attach it to a card base. Trim the edges flush with the card. Cut white cardstock to the same width as the black. Cut shoulders by cutting diagonally up, then join them with a tapering oval for the head. Cut a smooth(ish) curve along the bottom. Attach it to the black cardstock. Cut a small half-oval from tan cardstock. Use a black pen to add facial features, then attach it to the white cardstock. Cut a small cross from silver cardstock. Glue it to the center of the card front. Use a black pen to draw the chain that holds the cross. LOL, I'd have thought Sound of Music, awesome card. What a great gift idea!! LOVING that nun!!!!! This is darling. 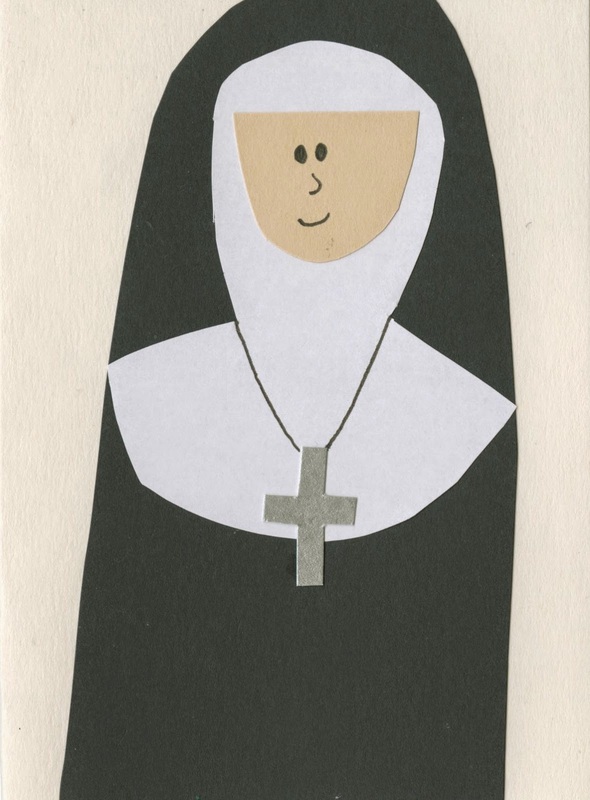 Actually, I work in a Catholic School so actually a nun card would work for me, lol.